Construct a LEGO® brick model of the Lincoln Memorial, national monument to the 16th President of the United States, Abraham Lincoln. Designed by architect Henry Bacon to resemble a classic Greek temple, the Memorial was officially dedicated to the American people at a ceremony on May 30, 1922, 57 years after Lincoln’s death. Today, it remains a hugely popular tourist attraction and is open 24 hours a day to the public. Just like the actual building in Washington D.C., this detailed LEGO set incorporates 36 Doric columns, which symbolize all the states within the Union at the time of Lincoln’s passing. The LEGO® brick model is designed with a removable roof so you can view a model of the Abraham Lincoln statue, the famous sculpture created by Daniel Chester French that dominates this iconic American edifice. Last known price is 20% above the initial Lego retail price! The Lincoln Memorial (21022) Lego set is no longer directly available from the sites below. However, 3rd party partners of these sites might still have the set available. 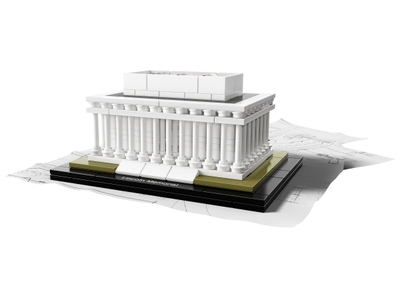 Alternate description Recreate the Lincoln Memorial with a LEGO® Architecture Landmark Series building set with removable roof and Abraham Lincoln statue. Booklet included with details on the design, architecture and history of the building.